1) Hematopoetic progenitors, microenvironment, and cellular immune responses. Vertebrate Hematopoietic Stem Cells (HSCs) are responsible for lifelong maintenance of blood cells. Dysregulation of hematopoiesis is at the origin of numerous pathologies including leukemia. Maintaining HSCs depends on signals provided by a complex micro-environment, called the « niche », which is made of vascular and osteoblastic cells. The cellular and molecular communication between vertebrate HSCs and their niche remains poorly understood. 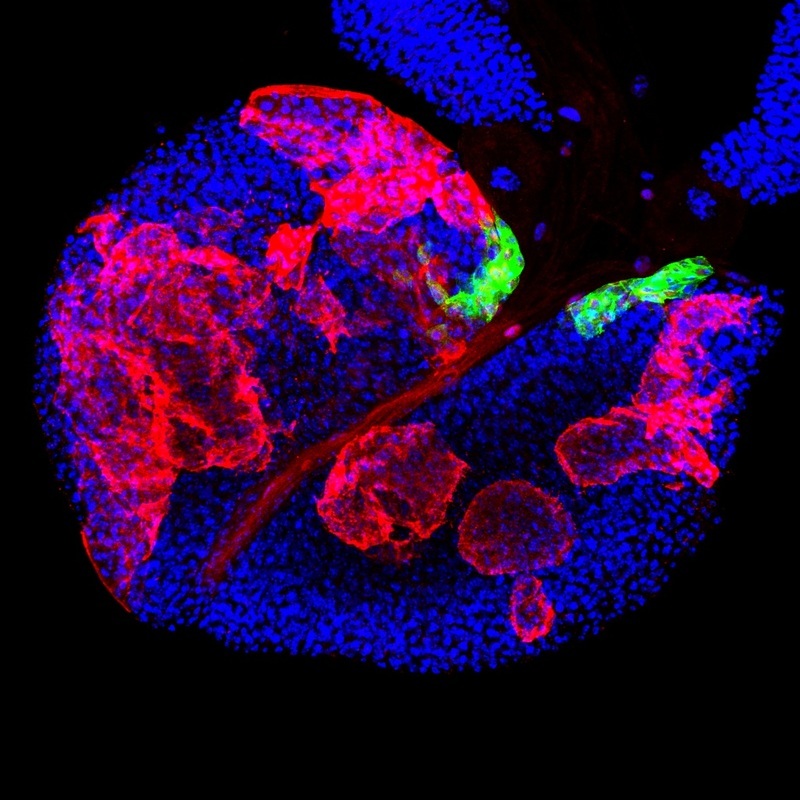 The discovery of the Posterior Signaling Center (PSC), a group of cells controlling blood cell differentiation in the larval Drosophila hematopoietic organ, the lymph gland (LG), has made Drosophila a model to investigate the interaction between hematopoietic progenitors and their microenvironment. The larval LG contains hematopoietic progenitors (pro-hemocytes) for three types of differentiated hemocytes: the plasmatocytes which are monocyte-like cells involved in phagocytosis, the crystal cells which are required for melanisation, an insect-specific immune and wound-healing response, and the lamellocytes which are devoted to encapsulation of foreign bodies too large to be phagocytosed. Interestingly, lamellocytes only differentiate in response to specific immune (wasp parasitism) or stress conditions, including increased levels of Reactive Oxygen Species. 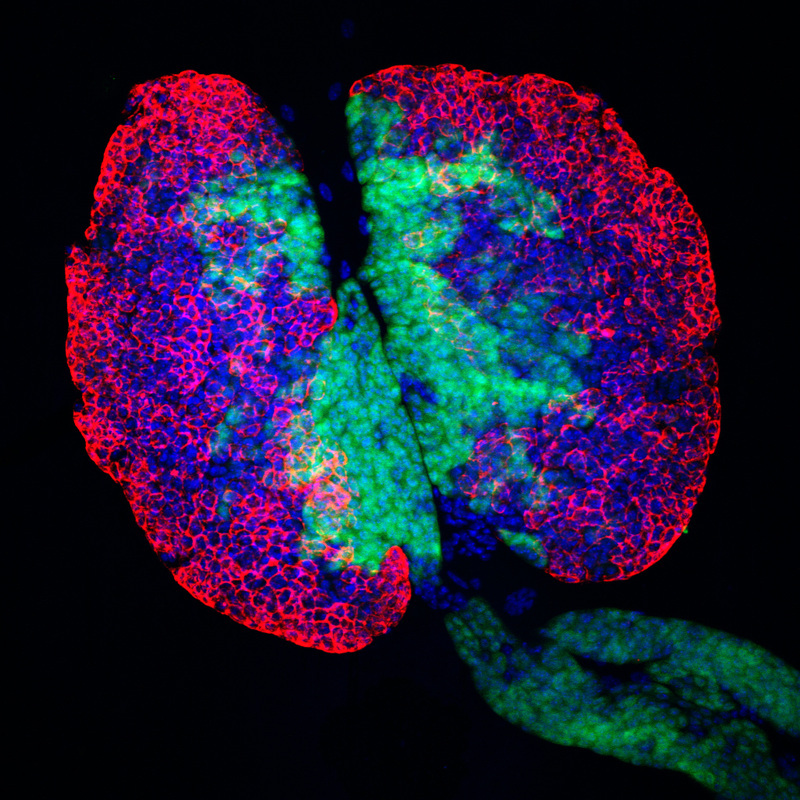 Over the years, our team has contributed to describing the ontogeny of the Lymph gland and discovering the role of the PSC (Crozatier et al., 2004; Krzemien et al., 2007; Krzemien et al., 2010a,b; Oyallon et al., 2016); characterizing the role of JAK-STAT signaling in controlling hemocyte homeostasis (Makki et al., 2010), and Dpp signalling in controlling the PSC size (Pennetier et al., 2012). We recently discovered that communication between the Drosophila vascular system and the PSC involves Slit/Robo signalling (Morin-poulard et al., 2016). - Continue deciphering the communication between the PSC and hematopoietic progenitors in the LG, and identifying the relevant gene networks. - Fully understand the transition steps leading from multipotent pro-hemocyte to hemocyte differentiation. 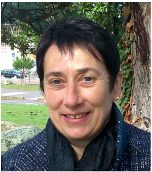 - Further decipher the role of the vascular system in controlling LG homeostasis. The overall goal is to integrate the different communications between the vascular niche and the LG, and between the PSC and hemocyte progenitors, in order to have a global view of hematopoietic stems cells maintenance of and the control of Drosophila hematopoiesis in normal conditions and upon parasitsism. Crozatier, M., Ubeda, J.M., Vincent, A., and Meister, M. (2004). Cellular immune response to parasitization in Drosophila requires the EBF orthologue collier. PLoS Biol 2, E196. Jung, S.H., Evans, C.J., Uemura, C., and Banerjee, U. (2005). 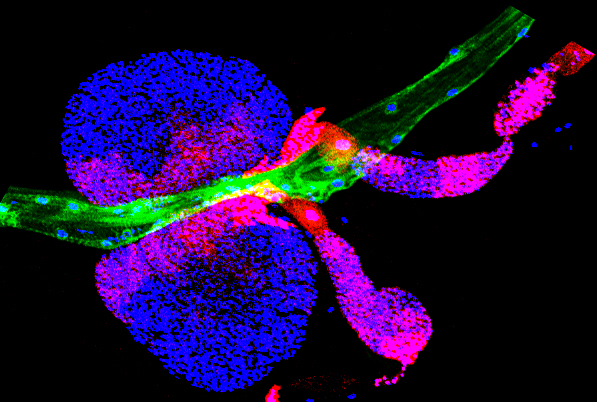 The Drosophila lymph gland as a developmental model of hematopoiesis. Development 132, 2521-2533. Krzemien, J., Crozatier, M., and Vincent, A. (2010a). Ontogeny of the Drosophila larval hematopoietic organ, hemocyte homeostasis and the dedicated cellular immune response to parasitism. Int J Dev Biol 54, 1117-1125. Krzemien, J., Dubois, L., Makki, R., Meister, M., Vincent, A., and Crozatier, M. (2007). Control of blood cell homeostasis in Drosophila larvae by the posterior signalling centre. Nature 446, 325-328. Krzemien, J., Oyallon, J., Crozatier, M., and Vincent, A. (2010b). Hematopoietic progenitors and hemocyte lineages in the Drosophila lymph gland. Dev Biol 346, 310-319. Makki, R., Meister, M., Pennetier, D., Ubeda, J.M., Braun, A., Daburon, V., Krzemien, J., Bourbon, H.M., Zhou, R., Vincent, A., et al. (2010). A short receptor downregulates JAK/STAT signalling to control the Drosophila cellular immune response. PLoS Biol 8, e1000441. Oyallon, J., Vanzo, N., Krzemien, J., Morin-Poulard, I., Vincent, A., and Crozatier, M. (2016). Two Independent Functions of Collier/Early B Cell Factor in the Control of Drosophila Blood Cell Homeostasis. PLoS One 11, e0148978. Pennetier, D., Oyallon, J., Morin-Poulard, I., Dejean, S., Vincent, A., and Crozatier, M. (2012). Size control of the Drosophila hematopoietic niche by bone morphogenetic protein signaling reveals parallels with mammals. Proc Natl Acad Sci U S A 109, 3389-3394. Morin-Poulard, I., Sharma, A., Louradour, I., Vanzo, N., Vincent, A. and Crozatier, M. Vascular control of the Drosophila hematopoietic microenvironment by Slit/Robo signalling Nature Communications (in press). Each Drosophila muscle is seeded by one Founder Cell issued from division of a Progenitor Cell (PC). Muscle identity - shape, size, number of nuclei, skeletal attachment sites - reflects the expression by each Progenitor Cell of a specific combination of identity Transcription Factors (iTFs). Our laboratory investigates 1) How positional information and developmental time integrate during specification of Progenitor Cell identity. 2) How Progenitor Cell identity is transferred to the other nuclei during muscle differentiation muscle fibers and translated into specific muscle morphologies. 3) The specification and role and a novel type of deformable muscles connecting internal organs, the Thoracic Alary-Related Muscles. The overall aim of our studies is establishing a dynamic view of the transcriptional control of muscle Progenitor Cell identity in Drosophila, and a framework for studying interactions between general myogenic Transcription Factors and iTFs in evolutionary diversification of muscles. Enriquez, J., Boukhatmi, H., Dubois, L., Philippakis, A.A., Bulyk M.L. , Michelson A., Crozatier, M. and Vincent, A. (2010) Multi-step Control of Muscle Diversity by Hox Proteins in the Drosophila Embryo. Development, 137, 457-466. Boukhatmi, H., Frendo J.L., Enriquez, J., Crozatier, M., Dubois, L., and Vincent, A. (2012) Tup/Islet1 integrates time and position to specify muscle identity in Drosophila. Development, 139, 3572-3582. Boukhatmi, H., Schaub, C., Bataillé, L., Reim, I., Frendo J.L., Frasch, M. and Vincent, A (2014). An Org‐1/Tup transcriptional cascade reveals the existence of different types of alary muscles connecting internal organs in Drosophila. Development, 141:3761-3771. De Taffin, M., Carrier Y., Dubois, L., Bataillé, L., Painset, A., Le Gras, S., Jost, B., Crozatier, M. and Vincent, A. (2015) Genome-wide mapping of Collier in vivo binding sites highlights its hierarchical position in different transcription regulatory networks; PLoS ONE. Dubois, L., Frendo J.L., Chanut, H., Crozatier, M., and Vincent, A. Genetic dissection of the Transcription Factor code controlling serial specification of muscle identities in Drosophila. Under revision. Bataille, L., Boukhatmi, H., Frendo J.L., and Vincent, A. Integrating transcriptional dynamics of muscle identity and differentiation programs during Drosophila muscle development. Under revision.